This was originally posted in February. I’m taking a few days off from blogging while I recover from the election and the end of school. Meanwhile, I’ll insert a few encore performances (summer reruns) so all of you faithful readers can have a fair amount of content. Sorry, student. 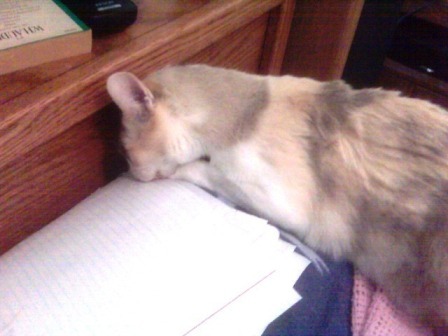 We might feel your pain, but the cat making your homework late is just another variation on an old theme. In my home, projects are at risk of being eaten, but not by a dog. Note to self; do not store student projects under the piano. In addition, feed bunny frequently. 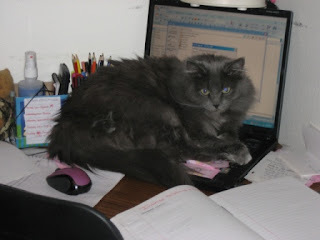 Now if only we could train the animals to make coffee while we’re busy grading, progress reports would go so much faster! 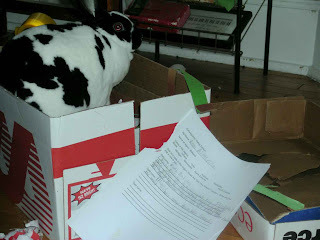 This entry was posted in bunnies bunnies everywhere, the coffeepot's on and tagged teachers live at school by Daisy. Bookmark the permalink.